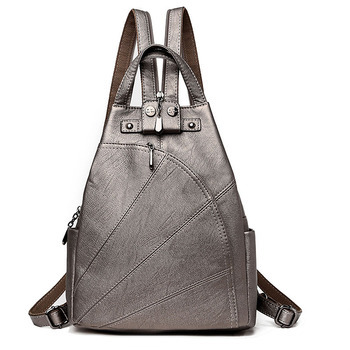 First of all, anyone using this Trendy Women Genuine Leather Backpack receives inspiration to be stylish. Then you soon come to the realization that with this bag, it’s also possible to be both sophisticated and innovative as well. 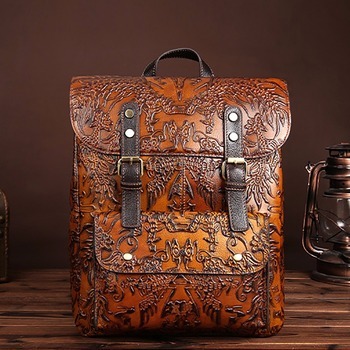 Then as you begin to enjoy the freedom that comes from simply throwing this amazing backpack over your shoulder you find out that another feature of this bag is the shoulder strap that contains a zipper that zips up to enable it to also be used as a crossbody bag. Finally, when it is being used as a backpack, because this bag distributes weight evenly between your shoulders it aids in the prevention of backaches and pain. Get a backpack was happy!!!!! What is soft leather and sewing quality! You Can See immediately, factory finish!!! Recommend! Color Purple life looks much better!!! Ryukzachek-Superb! Leather soft, thick, carefully sewed. Pen convertible one motion of backpack bag is obtained. A lot of pockets. Delivery, 2 weeks in SF. Cool backpack. Do Not expect a high quality. Nice backpack, not big,, 5 pockets. Can be worn as a backpack and as a shoulder bag and shoulder. Comfortable! Recommend store and goods. Delivery two weeks. Liked backpack! Fast shipping. Thank you very much!